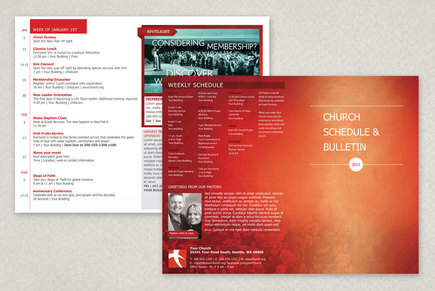 This is a bulletin style half-fold brochure, which would be fitting for a church, community group, school or non-profit, or any other company that has a busy schedule and needs to spotlight events and weekly happenings. The soft but vivid red tones set a warm and inviting feeling which ties in with the straightforward presentation of important events and busy schedules. The simple no-clutter layout allows for visitors to quickly identify the event they are most interested in. Its also multi-functional, as they can take it home, fold over to reveal the calendar side and post in on their fridge.